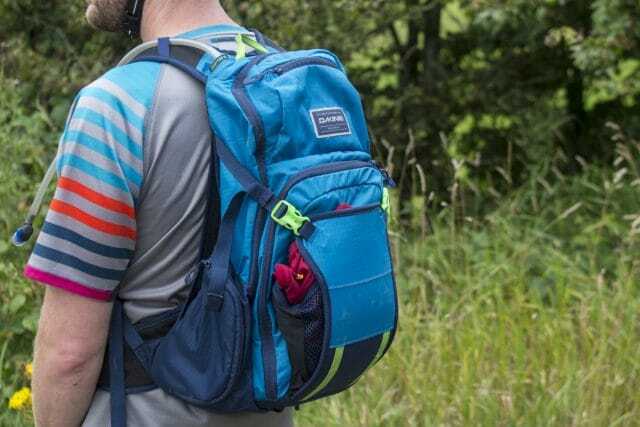 Dakine might not be the first name to spring to mind when you think of hydration packs, but the brand has been in the game longer than many, being one of the first companies to make bags aimed specifically at gravity riders. The original Drafter was released at the height of freeride fever, and was one of the first “huck sacks” that could carry armour, goggles and a full face helmet as you self-shuttled to your back country trails (regardless of the fact that said trails were probably in Surrey). Bombproof in construction and generous of capacity, my digital camo Drafter was a faithful ride companion and trail tool carrier for many years. 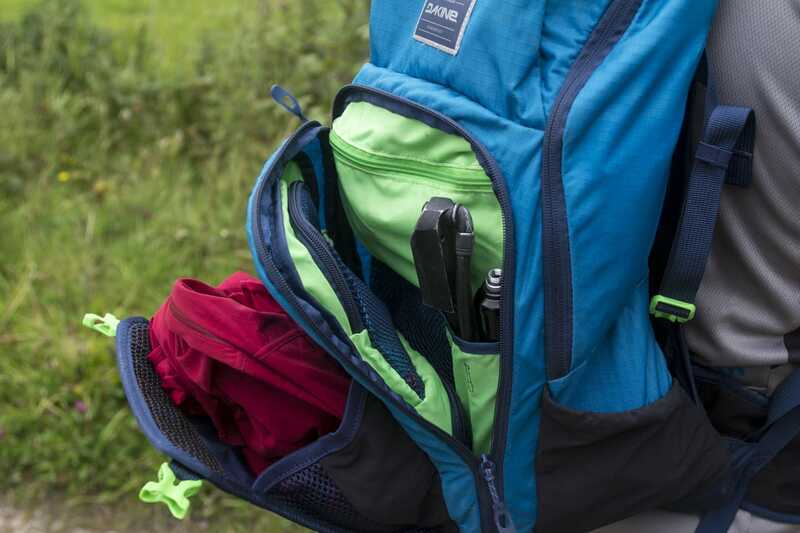 Dakine’s Drafter pack is available in 10L, 14L and 18L sizes. The latest model of Drafter is still aimed at people who want to take everything, but adds a dose of finesse and organisational capability to the classic design. It’s available in three sizes from 10-18 litres, as well as men’s and women’s fits. I’ve been testing the Goldilocks 14-litre version in Black, and Wil has been using the 18L version in Blue, though there’s a bunch of other colours including a Hawaiian-inspired design that only Chipps could possibly carry off. You get an external stretch pocket for amour and extra layers. Internally, the Drafter is well thought out. There’s a voluminous main compartment that’s complemented by a long, slim front compartment with organiser pockets for your tools and pump. 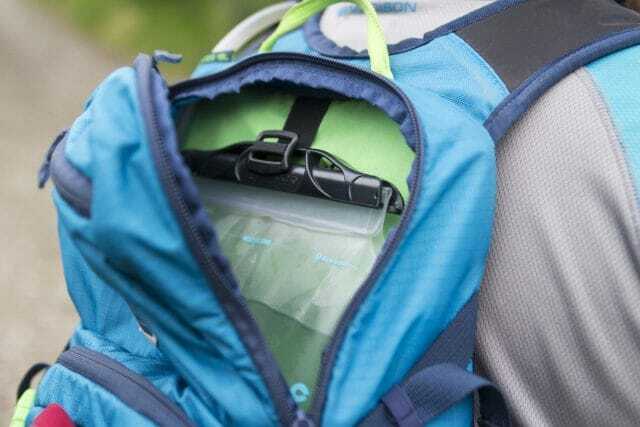 A fleecy top pocket stores your specs or phone, and a stretchy side pocket can take snacks and an inner tube (Or hip flask – it is night riding season, after all). There’s additional external storage capacity via a front flap with adjustable buckles, which will swallow a jacket and lets you clip a full face helmet to the outside. Got more crap? There are two concealed straps tucked away at the base of the bag that can be pulled out and clipped to daisy chain webbing on the front of the pack so you can carry long, bulky items such as leg armour, a camera tripod, or a medium to large trail salami. There’s a storage hook for the reservoir, but it sits the weight up too high in the pack. The main compartment of the bag is split in half via a Velcro divider. 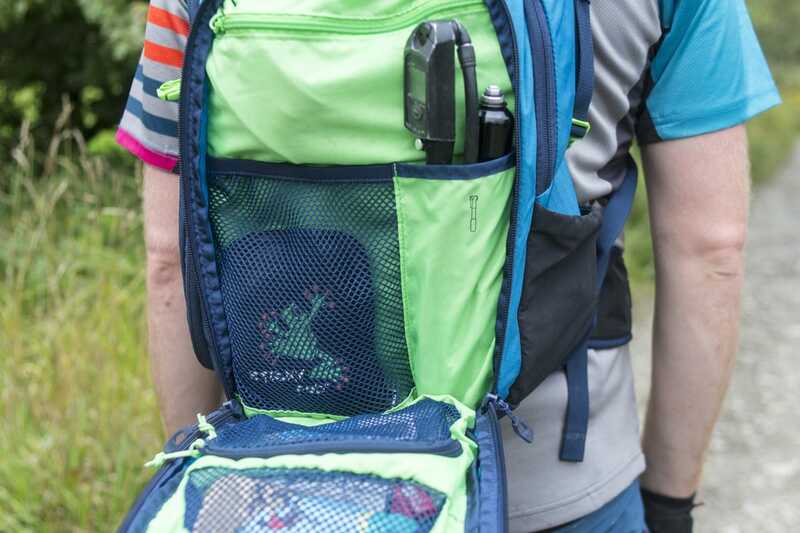 The supplied 3-litre Hydrapak bladder can go into either, though the top compartment features a stabiliser strap for the bladder to hook into. This puts the weight quite high up on your back, and on steep descents it provides more momentum for the pack to bounce around. Our preference was to put the bladder in the bottom compartment to lower the pack’s centre of gravity. 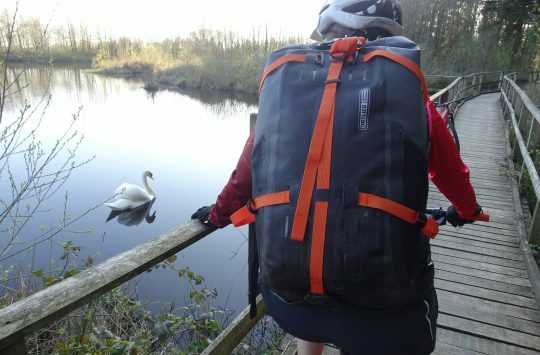 In Wil’s case with the 18L Drafter pack, there is quite a lot of space to fill. That means unless the bladder is full to the brim, and is surrounded by spare clothing to help pad out the rest of the compartment, it still tends to slosh about because there’s no stabiliser strap like there is in the top compartment. Some sort of retaining sleeve or compression strap would surely help to keep the bladder more steady. The magnetic valve attachment is ace. 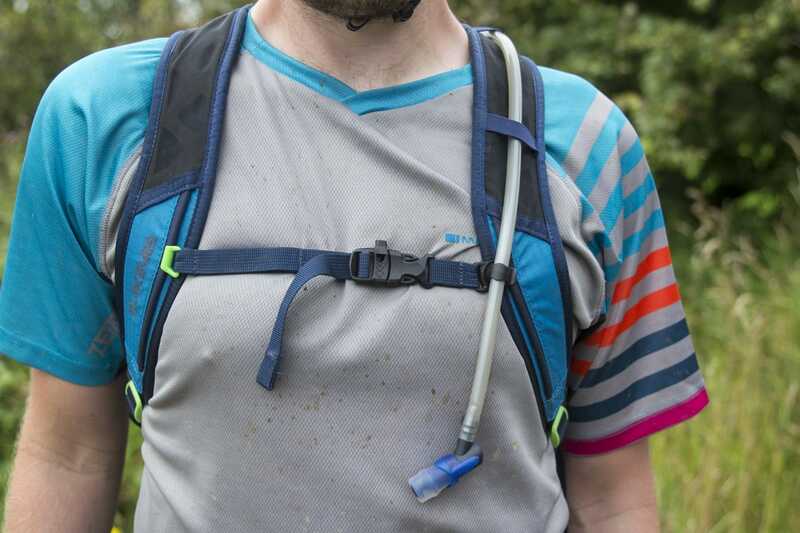 The bladder itself is excellent though, The hose is nice and long, disconnects for filling, and is held in place by a neat magnetic clasp, although you only have the option of routing it down the left shoulder strap, which might displease southpaws. It’s also nice and easy to pull out of the pack when needed, which does away with one of the most annoying aspects of older hydration packs that rely on you awkwardly stuffing a wobbly sausage of water into an already-full pack. Likewise, the front pocket folds out completely so you can find your stuff with ease. 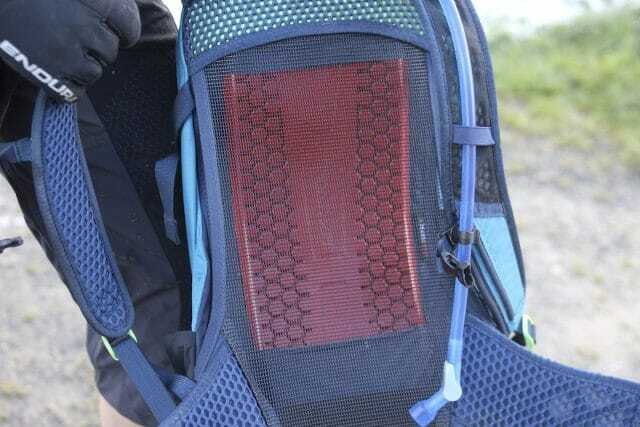 To prevent your tools and whatnot from being strewn across the trail, there’s a large mesh net, two smaller mesh zipped pockets, a pump sleeve (which will take a small to medium size pumps – sadly not my gigantic Topeak Mountain Morph) and a zippered back pocket with a key hook. With a full length zipper, tools are easy to access. 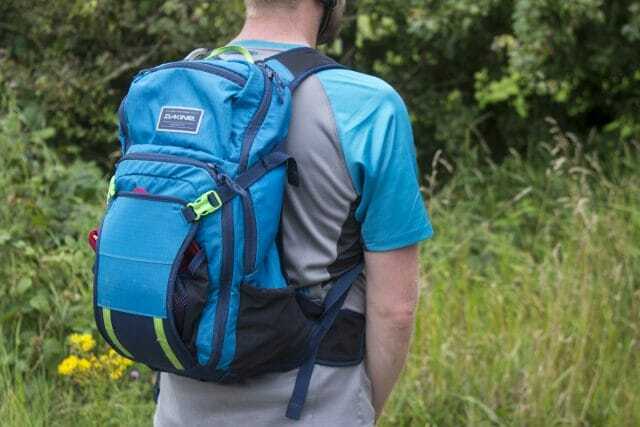 This was all fitted inside the 14L Drafter I’ve been using, and unless you’re planning a multi-dayer, this pack should easily be big enough for a grand ride out in the mountains. 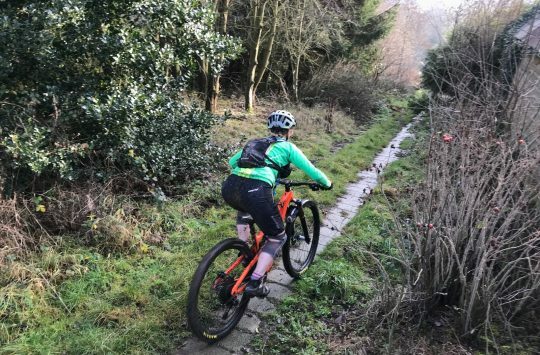 With more volume available for extra layers, food and potentially a lightweight sleeping bag, the 18L Drafter that Wil’s got is the better option if there’s a future for you that involves overnight bothy adventures. This is a really nice fitting pack that is highly stable, though the water reservoir does tend to slosh about. The exterior of the bag is made from medium weight ripstop nylon, which, while not fully waterproof, seems to shrug off splashes and gloop from a typical ride (Dakine also make a more weatherproof version, the Seeker, if you’re planning to regularly head out in foul conditions). It gives the pack a robust feel, but weight is kept very reasonable for a pack of this size (1kg when empty). The suspension harness puts the bag away from your back. 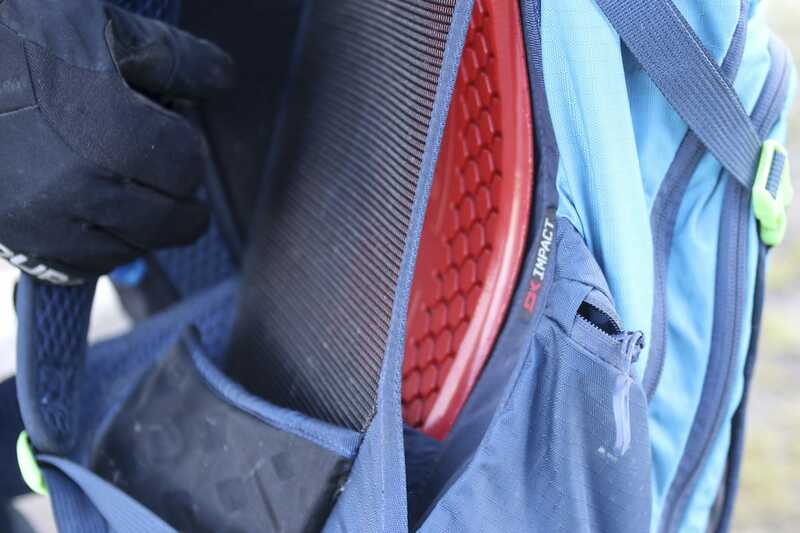 The back of the Drafter is curved to hold its weight away from your body, with a mesh layer for ventilation. The harness is very comfortable, and even with a sloshy water bladder inside, manages to keep the pack itself nice and stable.There’s also has a slot for a CE-certified back protector – an optional extra that you can pick up for £25, which Wil has been using in his blue bag. This flexible back protector is unnoticeable while riding, and although it does add a bit of weight, the extra insurance of having this between your spine and all those metal tools inside the pack is more than worth it. Wil’s been testing his pack with the Dakine spine protector. 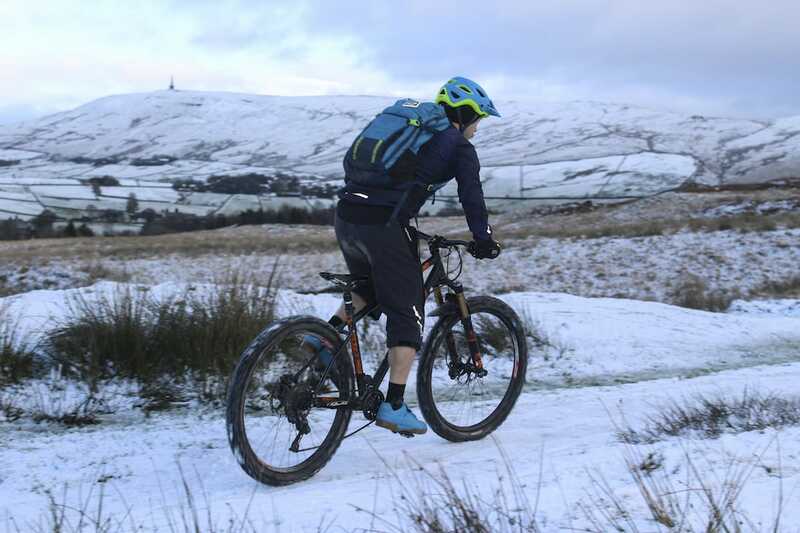 A £25 optional extra, this protector is flexible and largely unnoticeable while riding. Some bags are let down by the small stuff, but the detailing on the Drafter is genuinely excellent. There are chunky buckles and large zip-pulls, which are easy to use even in thick winter gloves. The Dakine logo at the top of the bag is reflective, a welcome change from a lot of mountain bike gear which seems to assume you’ll never be going anywhere near a road. 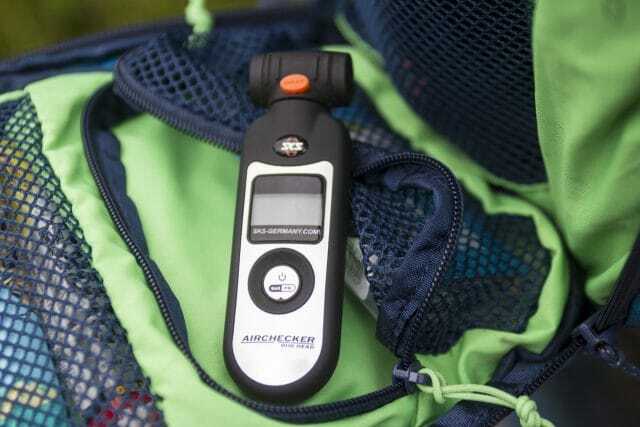 Another good safety feature is the built-in whistle on the chest strap. Sometimes these can sound like a geriatric canary’s death-wheeze, but this one is actually loud enough to be useful if you need to summon help. 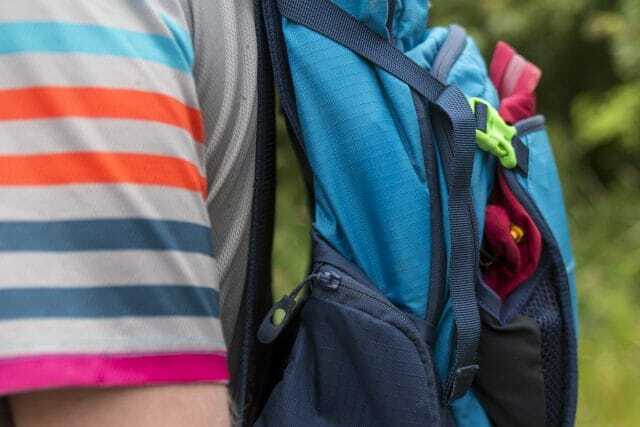 Flapping strap-ends are kept in check by captive elastic loops (except for on the shoulder straps) and everything seems to cinch down or tuck away happily, regardless of how much you’re carrying. It’s made of quality materials and is really well finished. Value-wise the Drafter is in the same ballpark as most of the other big brands, but includes a reservoir, which many packs these days miss out. Add in the optional back protector, and you’ve got a full-featured pack, with a more than enough capacity for a big day ride, for less than 150 notes. 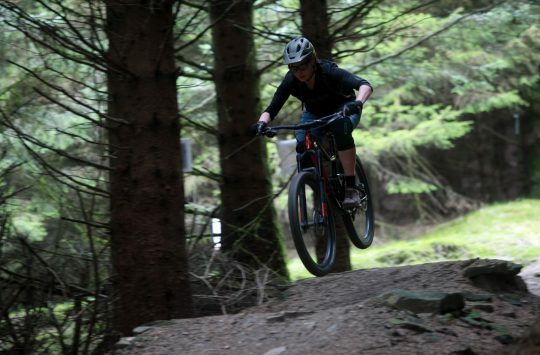 It’s not perfect – the lower reservoir pocket could do with a stabiliser strap, and the suspension system mounts the weight higher up than some designs, although that should also translate to a drier back in summer riding conditions. However it scores plus points for its dual main compartment, which makes loading it with water a cinch, its massive carrying capacity, its ease of access to all your stuff, and its clean unfussy looks.